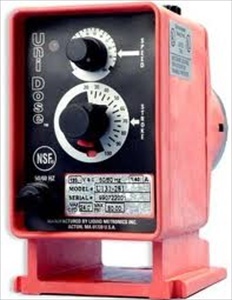 LMI Unidose Pump U14-281TT. This is a double dial, with stroke and speed dials. The stroke dial set how much chemical is moved. The speed dial sets the pace that the pump injects chemical. The pump will not exceed the gallons per day. Max 30 gallon per day. Good for pressures up to 80 PSI. Commonly used for many types of water treatment. Swimming pools, drinking water, well water, car washes, etc. NSF Approved.